The Vance & Hines race kit will cost $3,500 and consist of Vance & Hines XR1200 exhaust system, a Fuelpak fuel management system, race bodywork including number plate, single seat tail section and belly pan, 17 inch front wheel with matching front fender, steering damper, oil cooler relocator and race decal package. Teams will be allowed to upgrade suspension, hand and foot controls, brake components and instrumentation. Tires for the series will be supplied by Dunlop and Sunoco will supply their Sunoco 260 GTX fuel. 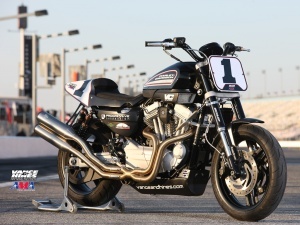 "We have racing in our DNA, Harley-Davidson has racing in their DNA and we are truly thrilled to bring Vance & Hines and Harley-Davidson back into AMA Pro Racing". "The XR1200 has proven to be an exciting platform for spec racing in Europe and this class will be a perfect cost effective paltform to showcase new talent on a national stage. Many of the finest motorcycle racers all over the world got their start in the AMA Supertwins class of the 1990's." said Terry Vance of the new series. The XR1200 Series will feature a $5,000 purse payout for each event, $2,500 for the race winner, $1,000, $750, $500 and $250 for second place through fifth place respectively. This series should be fun for the racers and entertaining to watch. Author: Dwight Domonkos /// submitted on March 4, 2010 - 3:06pm. I can't remember the last time a saw a clean 1963 Pontiac Tempest.